Hay is for horses, right? Horses, cows, sheep, goats, pigs and more types of livestock than I can think of in a quick minute. Yet, like bees, as crucial as it is to our food supply, most people don’t know much about hay nor do they care to. I mean, what does a bunch of tall grass, mowed, packed into bales and fed to livestock have to do with our high-tech busy lives anyway? Food prices have been creeping up for a while now, mostly by prices staying the same while the boxes and bags quietly shrink. Do they think we don’t notice? Here’s the funny thing about farming cause and effect: the price impact at the grocery store is slow to follow a disastrous farming event so when prices go up, we don’t remember why. Maybe we tuned out that farming story on the news – nothing to do with us, right? Or, what worries me more, many farming events aren’t covered on major news outlets at all. When they are, reports are at best brief, oversimplified and skewed towards Big Ag as if alternative methods did not even exist. This void of information about such a crucial piece of infrastructure we cannot live without is frightening. 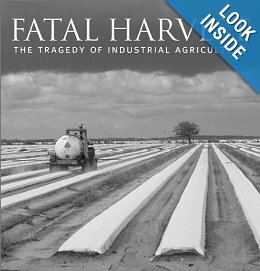 I know farming isn’t as fascinating as the Kardashians, but honestly, it is a pretty action-packed and intrigue-filled industry once you start doing a little reading. Here’s a good place to get started. It’s one of my favorites packed with beautiful and memorable photos and essays. And all ye Pittsburghers, guess what? There’s a copy at the Carnegie Library. You are using our amazing public library system aren’t you? Once again in Pennsylvania, it’s hay time. Of course things have been dry as a bone for weeks. But, now that it’s time to mow my hay, Murphy’s law is coming on strong. Rain, dark skies and spotty bad news on the weather channel. 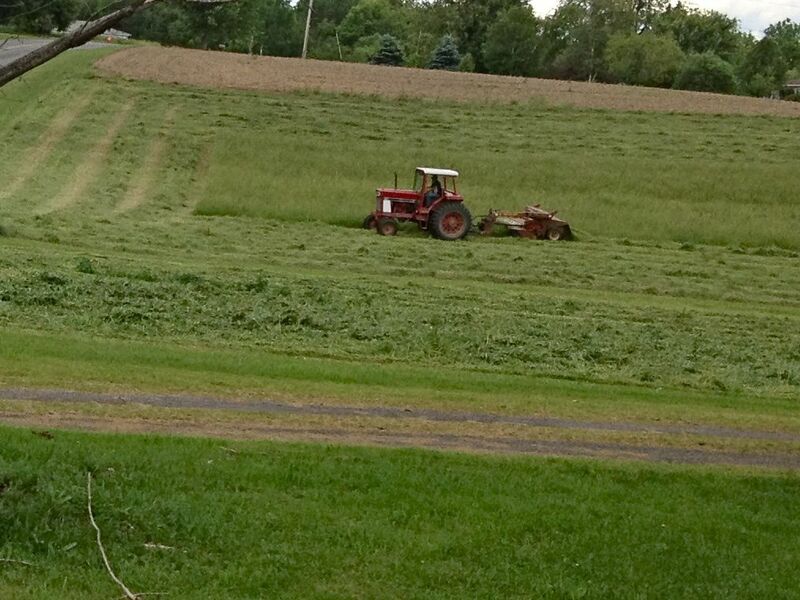 Last year, the first time I ever remember such a thing, we had no second or third cutting of hay. That may not mean much to you, but many years, some farmers get as many as four cuts in a season. Around here, you can count on at least two cuttings with the second & third cuts being generally considered the best quality. What’s a cut? It’s one harvest of mowing, raking and packing the hay into tight bales. 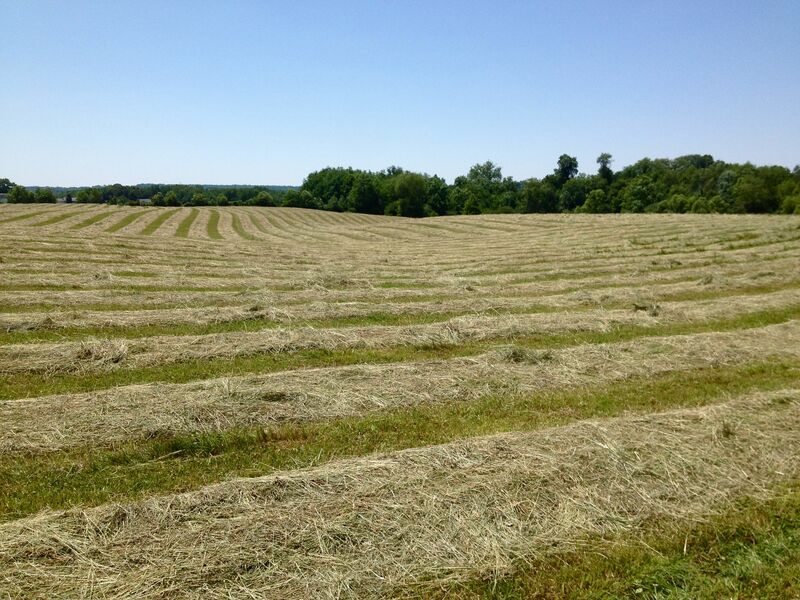 If you’d like to know more, here’s a good post explaining some of the intricacies of making hay from Baum Farm in Vermont. Last year, after being mowed once for first cut, the drought-stunted regrowth was so thin, mowing and bailing wasn’t worth the price of the gas needed to get the tractors and equipment out. 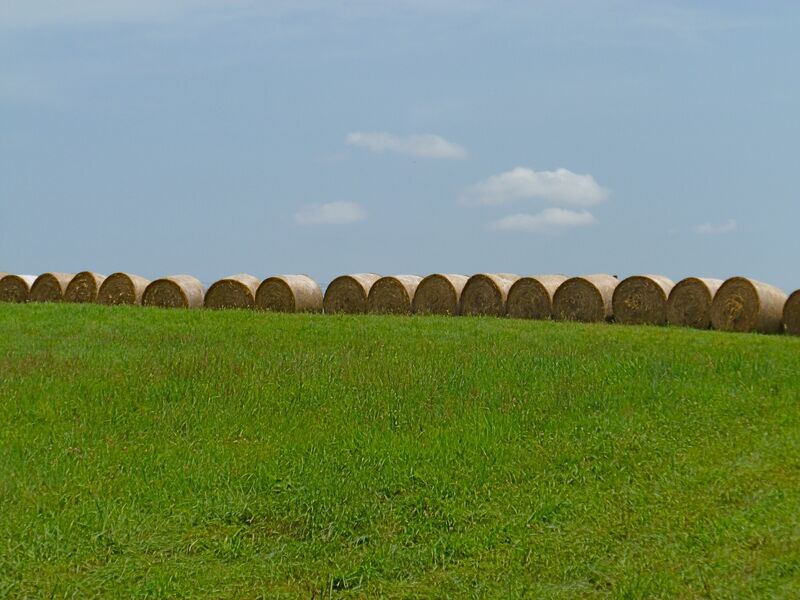 Hayfields were producing a fraction of their usual generous number of second and third cut bales. If you missed first cut, you were out of luck. And guess what? We missed first cut. Remember Business 101 when we learned about supply and demand? Supply goes down, demand goes up. When demand is high and supply low, prices go up. So it is with hay, corn and soy at the moment. For this farm, hay prices this past winter were at least five times higher than the winter before. What that means to you is that animals who eat hay, corn and soy and use straw for bedding increased their cost of living by at least five times if not more. It’s only a matter of time before that fact begins to show up in the grocery store. You probably didn’t pay too much attention to the drought talk on the news because rainy summer days spoil your fun and prices on items like pork, hamburger and chicken stayed stable or even went down this winter. Mainly because farmers were busy dispersing their breeding stock – animals farmers normally would never part with – into a buyer’s market to stop the fiscal hemorrhage of having to purchase feed for the winter. You had plenty of hamburger because expensive-to-feed dairy cows were being “retired” way before their time. Now, herd sizes are lean. There will not be as many cows, pigs and chickens. And prices for hay, straw, soy and corn are still higher than ever and farmers are scraping the bottoms of their coffers to hang in for another growing season. A third challenging growing season in a row will have harsh consequences. Back to basic supply and demand, groceries are bound to go up again. Milk, eggs, cheese and meat will be creeping up. In the butcher shop where I work, our largest chicken supplier went out of business without warning. Chicken prices have suddenly jumped from $3.09/lb for boneless, skinless chicken breasts to $3.89/lb and chicken tenders cracking the four dollar mark. In one week. Big difference. What does this all have to do with my tiny farm? Like many small farmers, I don’t have my own haymaking equipment, and rely on neighboring farmers to cut and bale my hay. Last year, my farmer didn’t get my first cutting mowed in time, and I just told you there was no second or third cut. So, I had to purchase hay. It was a real blow, let me tell you. And I am well aware that I was one of the lucky ones. Out west it was much, much worse. Not a total bust – grass did rebound in the fall and the hayfield kept the cows fed well into the winter so I did not need to feed dry hay for as many months. Since the thrifty Devon cattle eat nearly half the amount as some other breeds, I also didn’t have to purchase as much or find super-rich and super-expensive special quality hay, and the cows as usual stayed healthy, fit and satisfied on simple, ordinary first cut dry grass hay. So we survive to do it again this year. Today, the hayfield is tall and thick and ready for harvest. And, as much as I appreciate a good spring rain, this week, our fingers and hooves are crossed for some nice, dry, sunny, breezy days. What’s happening with food prices where you live? Update: Hay’s in! Thank goodness because if you live in Pennsylvania, you know we’ve had rain nearly every day for over a week, and more to come. We made it by the skin of our horns, and yield is still a bit lower than usual, but the hay is beautiful. We will be buying a bit more, and/or making second cut, but the larder won’t be bare. Whew! In SE Pa we have too much rain. I think it’s rained pretty much everyday for the past month. My garden hasn’t produced much of anything, but I really feel for the area farmers who are more dependent on their crops than I am. We’ll see how prices are when I get to the feed store tonight…eep! I know Trish. I am always aware that if I had to grow or forage every single bite that went into my mouth, I’d be in trouble. This is such an informative post Jackie. Thanks for sharing this and you’re so right that it is something that we don’t think about – and we should. I appreciate the links that you shared also. Wonderful post, chocked full of information and insight. The initial part about the economics of last year’s drought and it’s probable impacts going into this winter were especially good. Thank you! I sometimes wonder how long we as Americans will accept our current general state of apathy towards the things that really matter? No one understands agriculture and the things that affect it, but you can be sure there will be outcry when the bill starts going up! I’m curious if you have considered the idea of stockpiling forage for the winter and reducing/eliminating hay-making from the fiscal equation? It is something I am toying with in the planning of our farm, and really like the concept if I can make it work. I’ve heard Jim Gerrish quote a statistic from a farm questionnaire that asked “What are your top three costs of production?”. Of the top three answers, two were consistently “Making hay” and “Storing hay”. Your thoughts? I do use stockpiled forage in my own informal way. The last thing I want to be is without options, and boldly passing on making hay altogether is too scary a risk for me. I have to decide to cut hay before I know what the fall grass will be like; I’m afraid of summer drought so do not want to be caught having to buy hay in a crises. I don’t make three or four cuttings – two is the max, if yield is good, one. 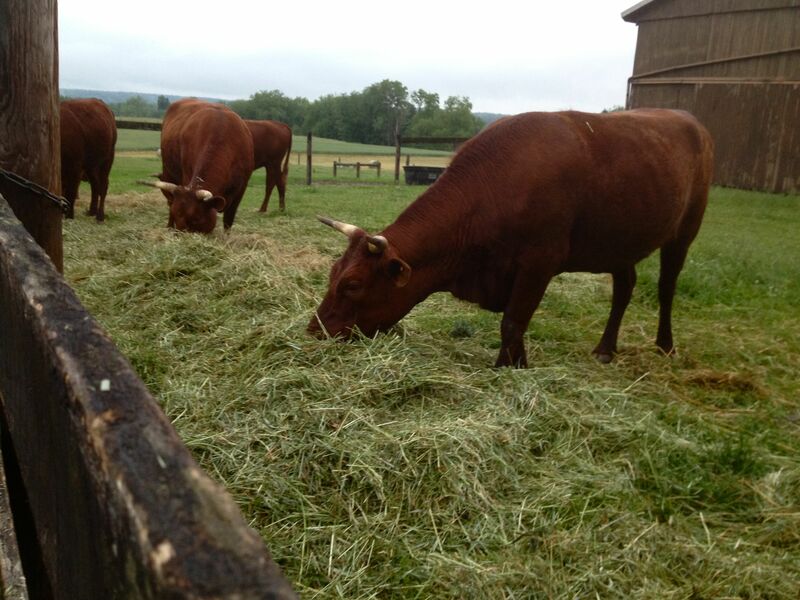 The cows are fenced out of the hayfield until it is regrown and can graze it late fall and winter. I also fear some of the fancy grasses – they can become toxic in certain weather conditions and I’m limited in my rotation options. I have a very simple mix of grass & clover which suits my thrifty cows well. I don’t spend the kind of money on fertilizer and seed required for a more complex system of stockpiled forage. I have grown fodder beets and pumpkins but they are not inexpensive in time and funds to properly store and use, but the cows and pigs do like the variety in the winter. Good stuff, thanks! I’ll have to see what we end up doing, once we are physically on the farm (less than two weeks away). It’s possible I may try no-hay, potentially making it work since I don’t know anything else!? I’ve by no means made up my mind though, I need to see things for myself first. Thanks again for the informative post! !